Us blonde’s often have to put our hair through quite a lot in order to achieve the perfect shade; for me that’s numerous trips to the hairdresser, each time a little bit blonder but of course the chemicals strip your hair and often leave it dry and weak – or worse – coppery. A few weeks ago I visited my old hairdresser in Herefordshire thinking I could get my hair done at a fraction of the price of my usual London salon, but came out with a bright blonde which didn’t suit me at all, and coppery roots! Not a good look! So I needed some serious SOS products, and thankfully I found just the ones. Firstly, the Joico Colour Endure Violet Shampoo is an instant at-home toner following a blonde colour treatment. The shampoo is bright purple, and this colour effectively removes any brassy tones from your hair. I used this shampoo every day religiously in the week following my dodgy hair treatment, and still use it every week to keep the brassiness at bay. You massage it in, and allow it to absorb for up to five minutes. The secret to the shampoo is their Multi-Specturum Defense Complex which contains Antioxidents and UV protectants which fight fading and any tonal changes. Hair is also strengthened and reconstructed at a cuticle level to give your hair back any nourishment lost in your colour treatment. The shampoo is £12.95 (currently 20% off!) and available from LookFantastic.com here. 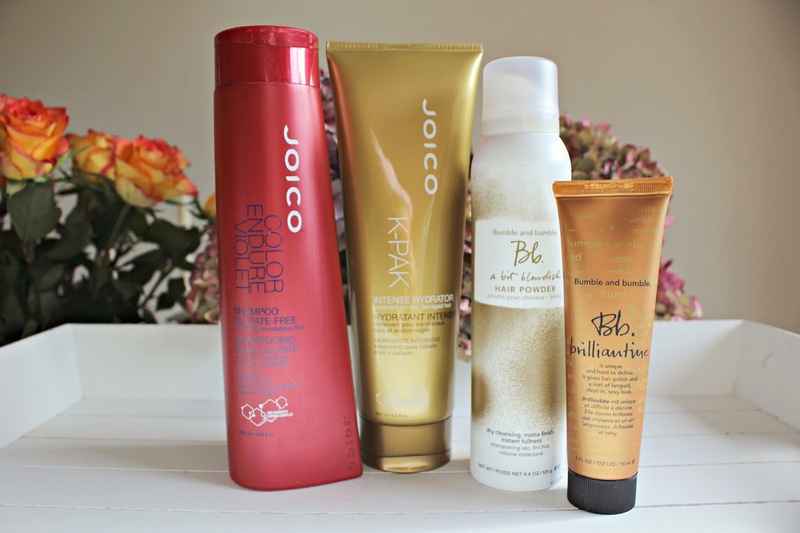 I then alternate between the matching Colour Endure Violet conditioner, or when my hair is beyond thirsty and crying out for moisture, I choose the Joico K-PAK Intense Hydrator – the cocktail of choice for hair so parched that only a serious drink could bring it back to life! It’s intensely nourishing and helps dry locks recover from chemical treatments and environmental damage. I apply it generously to the ends of my hair and leave it on for five minutes. The Lanolin and Shea Butter leave my hair ultra glossy and shiny and it’s thirst quenched – I reach for this whenever I want my hair to be über shiny and it never lets me down. It;s £12.75 for the K-PAK Intense Hydrator on LookFantastic.com. Another Blonde Hair SOS product in my collection is the Bumble & Bumble A Bit Blondish Hair Powder. It’s a multitasking product that I reach for on more than one emergency. Firstly between colours it acts as a super root blender – the powder masks darker roots for most shades of blonde meaning that you can leave it a little while longer before your next trip to the colourist. The powder can also be used of course to dry cleanse hair. If I’m super busy, or maybe I’ve had a nice blow-dry which I want to extend, i’ll reach for the powder to give my locks an extra day or two. Finally, the powder can create fullness and volume on days when my hair needs a little extra Uumph! It’s perfect for making your messy bun even messier. It’s a little pricey at £28.00, but once you try it you’ll see why it deserves this price tag! Also available on LookFantastic.com here. I featured Bumble Brilliantine in my Autumn Additions post recently here, but it also makes up the final product in my SOS collection. I’m pretty sure it’s meant to be a men’s product but I just love it on days when I want my hair to look a little ‘roughed up’ without the frizz! Its gives my hair texture and separation without zapping it of any moisture. So for thick hair that sometimes needs some serious de-poofing action, this product, used sparingly can calm even the wildest locks. It’s £19.00 online here. So that’s my arsenal of SOS products for Blonde hair in need of some major attention – what products are in your Emergency collection?